When we were in Iceland, we spent a day driving to the southeast to see the Glacier Lagoon. We’d booked a hotel out that way and planned to spend two days exploring the area. As we drove, I read parts of the guidebook aloud and we rolled our eyes when the writer described a town we passed as “the last stop for civilization.” So dramatic! Then, we drove…and drove…and drove. There aren’t rest stops in Iceland, so, you have to rely on whatever you can find. We found lots of lava fields. So, we drove…and drove…and drove. I felt a little panicky and began to regret the four cups of coffee at breakfast and all the water I’d had in the car. I can’t pee outside in the best of conditions, so, I knew the straight line winds coming across those flat lands were not going to be my friend should it come to that. As we approached the area where our hotel was, I plugged the address into Google Maps and we discovered that our hotel was actually an hour and 15 minutes beyond where we were. When booking your hotels in Iceland, be mindful of your “fells.” We thought we booked in Skaftafell but booked in Skalafell. We hit the road again and continued driving. We did stop at the Glacier Lagoon and then kept driving and finally reached our hotel, which was a working farm with a hotel attached. It was out in the middle of nowhere. We planned to spend two days there but there was nothing. We knew we had to change plans, so, Luisa went in and asked for a refund, explaining that it was much further out than we had expected. They gave us a refund without question. Despite our mistake, I have no regrets. First of all, at that hotel far from civilization, we saw the northern lights. Secondly, we had dinner at the hotel restaurant which was totally quirky. There were handmade fairy houses on each table. The food was delicious. And there was an odd little display of taxidermy. And that’s where a fox popped up! 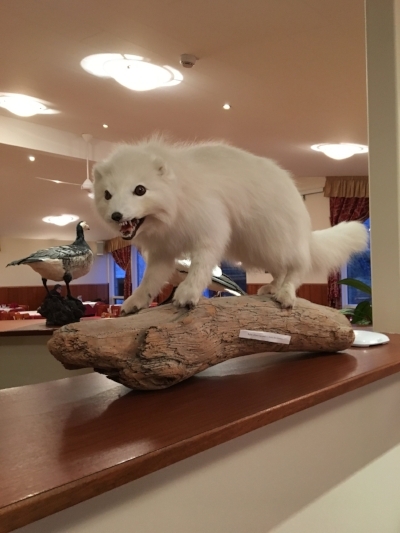 An arctic fox, no less! Taxidermy freaks me out a little bit but it’s also fascinating. This was the third time I’ve encountered taxidermy in an unexpected place. The first time was in 2012 in the hotel where the Aiming Low Noncon was happening. The second time was in 2014 in a bar in Wisconsin. And then this time…in a hotel in Iceland in the shadow of a glacier. There are many lessons to be learned from this experience. Believe what you read in guidebooks. Don’t drink a lot of coffee before a long road trip. Read the names of places carefully when booking hotels in foreign countries. Strangers can still be kind and generous. But I think the best lesson of all is that you have to find joy right where you are.